From an article by Brigid McConville © 1998, Reprinted from The Independent: Education (UK) with Permission. I was really excited because I was having a week off school and coming to a place I didn’t know and staying in a bed-and-breakfast. But I was also quite nervous, mainly of being on my own. But it was really nice because when I got there, there were all these nice ladies (trainee Davis facilitators) and we had tea. We did this thing called “release” because I had a headache. I had to let my mind’s eye release all the tension in my body. I felt tingly all over, my headache went and it was really nice. Doing release has helped me quite a lot, like when I was trying to remember how to say the alphabet backwards: I was tense and sort of bunched up, but then I released and got back on to my “point” and then I remembered it. My point is that place where I pit my mind’s eye when I want to pay attention, say when I’m reading. In my imagination it’s right above my head. For all my life, until today, I couldn’t concentrate on things and my mind’s eye wandered and went off in places that usually weren’t very convenient. Sometimes my mind’s eye doesn’t stay on-point; I see something outside the window and I drift off. Then I remember to put my mind’s eye back on-point and I can pay attention for longer. Today, Lin told me there were 26 letters in the alphabet and because I was on-point I remembered it! Today, I also modelled the upper case alphabet. I had trouble with F and C but we made them in really, really big block letters – “Friendly F” and “Colossal C” and we photographed them. I am happy about them now; they no longer trigger (confuse and disorient) me. When I first came here I was worried that I would lose my flair for art and acting, because I didn’t understand how the Davis method worked, but it doesn’t change my good abilities. It’s good; I can switch it on when I want to. I’ve already mastered my upper case alphabet and now my lower case too. I don’t get Bs and Ds and Ps and Qs mixed up any more. I got a headache again so I did release, without taking a pill as I usually have to. It went instantly. And then I got my alphabet completely right! Next we did ‘spell reading’, where I had to spell out the word and say it. We also did ‘sweep sweep spell’, where I dragged my finger along, revealing each litter in the right order and then it works; the word just comes. We also did ‘picture at punctuation’, where I had to stop at every bit of punctuation, and say what picture I saw. Before doing this, I used to read loads without taking it in at all. Today I had to make up a word; I made a massive clay ball and pulled bits of clay out and called it “fluppi!” It means when you are really excited, like being in a dyslexic box and kicking the box in. Before I came here, I was ‘fluppi!’. Lin helped me to get an “energy dial” in my imagination to control that “fluppi!” feeling. My dial is like a sharp, silver arrow with a crescent moon on the end. It’s in a chrome case, which is electric blue with silvery-black numbers from one to 10. Ten is for when I have loads of energy, but when I am having trouble sleeping, I turn it down to three and then one. We also made the meaning of the word “lamb” by making a model lamb in clay. 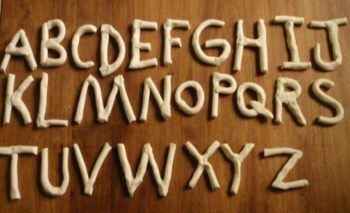 Then I had to say it and model how it’s written with letters in clay. I also mastered punctuation marks today so they can’t trigger me when I’m reading. This was my “hump” day; I felt really tired, but I got over it. 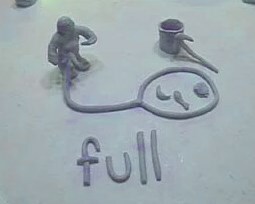 Today I did the trigger word “full”. I made a box full of cherries in clay. I had to point at the model and say: “You are full!” I also had to run my finger along my modelled letters and say “You say full!’. We also did “fine tuning” to help me balance. I had to throw a ball standing on one leg while catching two balls thrown at me – and I can do it! I never used to be able to. I am much quicker now. I also did spelling. I learned how to spell “peace”, “choose” and “renaissance”; I can spell them backwards because I can see the pictures of the letters in my mind. When I am spelling, I have to write down the pictures (of letters), write the possibilities, then cross out the wrong ones and get rid of them out of my mind. Then Lin tells me the right spelling; I go on point, say it through and then say it out loud. I remembered them! It’s really good; I’m going to use that again. I also made clay models of what “consequence” and “responsibility” mean, and I mastered them. We did another trigger word – ‘into’ – and I mastered that. We also did trigger reading – reading to find which words trigger me most. We also did more ‘sweep sweep spell’, exposing one letter at a time. If the word pops out, I say it, but if not, I say each letter and then it might work. I have only had half a day as Lin talked to mum about keeping up the good work when we go home. I hope I will because this is really going to help me. “Bridget is reading better now and she did a piece of work recently with hardly any spelling mistakes. Before the course, anything distracted her and she couldn’t sit at a table for five minutes, but now she is able to pay attention and do things on her own. McConville, B. (1998). I can see clearly now: beating dyslexia with clay: Diary of week with a Davis facilitator. Retrieved April 18, 2019 from Davis Dyslexia Association International. Dyslexia the Gift website: http://www.dyslexia.com/?p=2217.